When I see you again, I shall tell you exactly what I then understood. Putting aside all irrelevant questions (to what end such music can or should serve? ), and speaking from a purely aesthetic point of view, has Wagner ever written anything better? The supreme psychological perception and precision as regards what can be said, expressed, communicated here, the extreme of concision and directness of form, every nuance of feeling conveyed epigrammatically; a clarity of musical description that reminds us of a shield of consummate workmanship; and finally an extraordinary sublimity of feeling, something experienced in the very depths of music, that does Wagner the highest honour; a synthesis of conditions which to many people - even "higher minds" - will seem incompatible, of strict coherence, of "loftiness" in the most startling sense of the word, of a cognisance and a penetration of vision that cuts through the soul as with a knife, of sympathy with what is seen and shown forth. We get something comparable to it in Dante, but nowhere else. Has any painter ever depicted so sorrowful a look of love as Wagner does in the final accents of his Prelude? I cannot think of it without feeling violently shaken, so elevated was I by it, so deeply moved. It was as if someone were speaking to me again, after many years, about the problems that disturb me - naturally not supplying the answers I would give, but the Christian answer, which after all has been the answer of stronger souls than the last two centuries of our era have produced. When listening to this music one lays Protestantism aside as a misunderstanding - and also, I will not deny it, other really good music, which I have at other times heard and loved, seems, as against this, a misunderstanding! In the art of seduction, Parsifal will always retain its rank - as the stroke of genius in seduction. - I admire this work; I wish I had written it myself; failing that, I understand it. - Wagner never had better inspirations than in the end. Here the cunning in his alliance of beauty and sickness goes so far that, as it were, it casts a shadow over Wagner's earlier art - which now seems too bright, too healthy. Do you understand this? Health, brightness having the effect of a shadow? almost of an objection? - To such an extent have we become pure fools. - Never was there a greater master in dim, hieratic aromas - never was a man equally expert in all small infinities, all that trembles and is effusive, all the feminisms from the idioticon of happiness! - Drink, O my friends, the philtres of this art! Nowhere will you find a more agreeable way of enervating your spirit, of forgetting your manhood under a rosebush. - Ah, this old magician! This Klingsor of all Klingsors! How he thus wages war against us! us, the free spirits! How he indulges every cowardice of the modern soul with the tones of magic maidens! - Never before has there been such a deadly hatred of the search for knowledge! 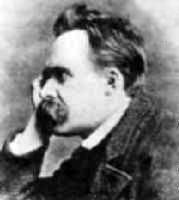 - One has to be a cynic in order not to be seduced here; one has to be able to bite in order not to worship here. Well, then, you old seducer, the cynic warns you - cave canem. 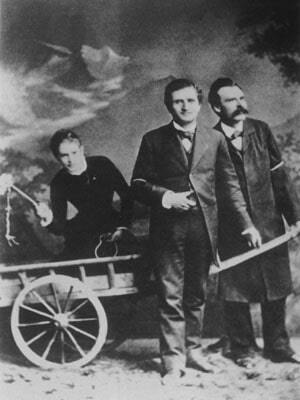 Nietzsche's objection to Wagner preaching chastity might have been motivated partly by envy; since Nietzsche (right) was famously unsuccessful with women. In this photograph it is Lou Salome (left) who is holding the whip.